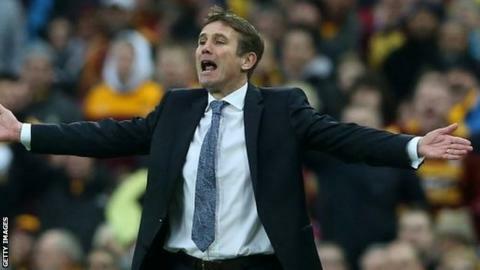 Losing League Cup finalists Bradford needed a late equaliser from James Hanson to secure a draw with Dagenham & Redbridge. After an even first half, the Daggers had a great chance to take the lead in the second half when Kyel Reid fouled Luke Wilkinson in the area but Sam Williams fired the penalty wide. But Luke Howell gave them the lead with a well-hit effort from 18 yards. That looked to be enough but Hanson popped up to tap home from close range. Burnett's side formed a guard of honour for the hosts as they entered the pitch, in recognition of their run to the League Cup final. Bradford made a bright start to the game and nearly led when Michael Nelson lobbed a half-cleared free-kick back into the box but Rory McArdle could not keep his effort down. The Daggers fought back and Medy Elito ended a neat run with a powerful shot that Jon McLaughlin did well to tip onto the woodwork. After a cagey opening to the second period the visitors were awarded a spot-kick when Reid clipped the heels of Wilkinson. Following a lengthy discussion between Williams and Elito over who should take it, the former Villa and Yeovil man sent his effort wide of the post. The Daggers were not to be denied for long though and went ahead when Ben Strevens showed lovely feet to flick the ball to Howell to send a low shot beyond McLaughlin. With time running out Hanson grabbed the equaliser after Zavon Hines's low cross took a couple of deflections and fell to him barely a yard out. Parkinson's side poured forward and Nahki Wells had a last-minute shot cleared off the line by Adu Ogogo but they are now 10 points off the play-off places with three games in hand on seventh-placed Cheltenham. "We're a bit disappointed. I think we just lacked a little bit of extra quality in the final third but I have no complaints. "I was convinced the ball had gone out before they scored and I thought the linesman made a few mistakes. "It could turn out to be a very good point because it was starting to look a bit desperate. "We had a big setback on Sunday because we felt we let ourselves down. It was important we followed it up with a performance today." "It is always going to be difficult to replace a personality like John Still. "We said we wanted to carry on as we were and get the ball down and be brave. I thought we did that."